Welcome to Pat’s Power Tools & Central Vacuum Services. Locally owned and operated for over 25 years, we provide various vacuum repair services and new vacuums to the greater LaPlace, Louisiana area. Our success is built on our commitment to providing the highest quality of central vacuum installation services for properties of all sizes. Our friendly staff of trained technicians and the sales team is always ready and willing to help you find what you need to make your vacuum perform at its best. We specialize in bringing you a wide variety of services at a minimal cost. As an authorized DrainVac dealer, we provide top-notch systems designed to pick up and filter solids and liquids. Get a clean, healthy home or business. We provide a 15-Year warranty for some parts and service. No matter what brand your vacuum may be, at Pat's we can help you repair it, even if you did not buy it from us. Our goal is to do the job right the first time, and provide our customers with outstanding service. Known as built-in vacuums, central vacuums are the choice vacuum system for many homeowners today. Not only are these vacuums more powerful, penetrating deeper to remove dirt and debris, they offer a cleaner, less noisy vacuuming environment with more cleaning versatility. Because central vacuum systems are located away from the living area of your home, air pollutants are greatly reduced. This benefits all of us allergy sufferers out there. Common household vacuums tend to re-circulate dirt and debris regardless of filter quality or manufacture claims. Central vacuum systems on the other hand pull the dirt out of the existing room and into the room housing the main central vacuum unit. This allows for any pollutants to remain away for the air ways of the vacuum’s operator. Most central vacuum systems today can be used either with a bag or are bag less. We can help you upgrade your vacuum if you’re looking for better cleaning power. Another benefit of built in central vacuum systems is more suction power (air watts) with the ability to clean deeper. 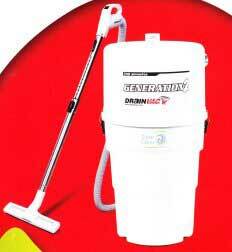 A larger dirt canister means less maintenance with fewer times emptying the central vacuum system. In conclusion, not only do central vacuum systems add value to your home, because of their cutting edge cleaning technology and advanced filtration, central vacuums keep your home & family free of harmful particles while at the same time, making your cleaning trouble free. Call us today at 800.865.7195 or send us an E-Mail us for more information.